Burton Doubles 2016 - the Multimedia Extravaganza! Burton, a classic and historic venue ... the ideal setting for a video and audio online multi-platform interactive assault on common sense and common decency as Madaxeman.com launches a PODCAST... and a VIDEO PODCAST to supplement the match reports!! See (and hear) how the Triumverate Roman & Jewish army fared against the Romano-British & Patricians, 3K Chinese & Hsiung Nu, Armenians & Romans and Parthians (Elemayan) & Hatrenes in 4 separate fully detailed ADLG match reports! They also very kindly sent me a copy of their Tercio rules some months ago, but unfortunately life has gotten in the way of me even getting around to reading them - so one day you might find a review on this site too! 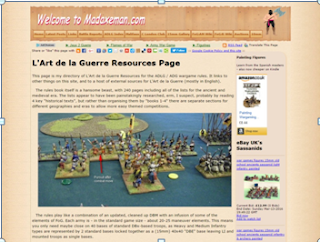 With an ever-increasing amount of L'Art de la Guerre content now appearing on this and other sites, I've set up an ADLG Index page on Madaxeman.com to pull together all of the L'Art de la Guerre content into one place. This page has all of the links to battle reports, ADLG resources across the web, places where you can buy the rules and also links to the ADLG Wiki which is slowly growing on this site as well. The link for this page now forms part of the main site menu in the site header too. Gertfaux, on the industrial outskirts of Bristol at Bristol Independent Gaming has seen my first ever Malifaux tournament just one year ago... and now I was back with Marcus, the King of the Jungle for a second year of Malifaux.